Dealing with a crisis online can be daunting, especially if you’re not prepared. And with social media’s immediacy and consumer feedback, retaliation can happen quickly. Negative sentiments can easily be shared, searched, and escalated before the truth or clarifying explanations have the chance to be organized. Having a plan in place to respond in certain situations can help prevent a potential reputation mishap from escalating farther than necessary. If you do find yourself immersed in some bad publicity, here are a few tips to help keep the situation from escalating too quickly. Trying to dodge responsibility if/when you’re clearly at fault will only do more harm than good. You can’t backtrack on something that has already entered the public arena, so rather than trying to act as though the issue hasn’t happened, own up to it. In October, social sharing platform Buffer was hacked. Rather than playing the victim or acting like they hadn’t been compromised, they immediately put out messages addressing the matter along with their intent to investigate and update their audience accordingly. They also promptly stopped sharing from their social platform to mitigate the damage while they investigated. Shortly after, a blogpost had been written, and they actively used Twitter and Facebook to post real-time updates. As Search Engine Land noted, the blog post served a number of purposes. They then continued to relay ways that customers can protect their accounts while the issue was being resolved. Customers began commenting on the blogpost in waves, and rather than express anger at the hack, they showed their appreciation of Buffer’s transparency and grace in handling the situation. 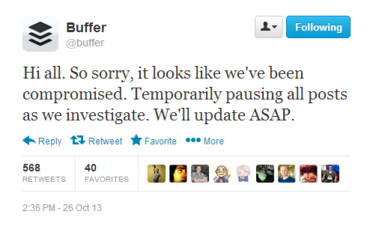 One of the reasons Buffer was able to remedy their situation so seemingly-easily is that they addressed it quickly. One brand that recently encountered an online backlash is McDonald’s. McDonald’s introduced a #CheerstoSoshi hashtag. The campaign’s intent was for consumers to send personalized messages to athletes and teams competing in Sochi by using the hashtag. However, upon its debut, there was an array of backlash. 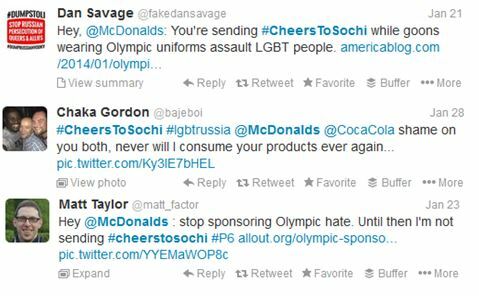 A search for the #CheersToSochi tag turns up a massive (and growing) number of protest Tweets, which McDonald’s effectively ignored for the first few days. It wasn’t until four days later that they released statements clarifying the campaign’s intent. While this comment does relay the true intent (and non-intent) of the campaign, there was still a massive delay in response. This gap in acknowledgement allowed the situation to escalate. Social media is fast-moving and it’s vital to be prepared and at least post a brief update to let people know there are plans to address the situation. Depending on what kind of incident has taken place, it’s important to consider the best platforms for your response. For example, the McDonald’s incident occurred on Twitter, so it was important for McDonald’s to be sure that a tweet was sent out acknowledging it. If backlash takes place on a specific platform, responding on that platform first and foremost is the wisest choice. Constructing the tweet, too, can pose a significant challenge since you only have 140 characters to work with. We’ve received inquiries about whether a tweet should be deliberately long to discourage retweeters from editing it. Unfortunately, people can and do still edit tweets to be able to add commentary however they so desire, so the length of the tweet itself doesn’t need to be of exact concern. In a broader sense, such as Buffer’s situation where the hack took place on the site and not on social media itself, they turned to various different places to get the word out. Granted, they are a social media dashboard so they know their client base is social media savvy. But taking to the blog to be able to best elaborate on what happened was a useful strategy in that it allowed them to fully expand on what happened, it welcomed feedback, and also served as a directed place to send concerned Twitter and Facebook users. Similar complaints often happen on blog posts themselves or in Facebook comments, too. People may leave a comment with their opinions on a certain subject matter that may not be positively attributed to the brand on whose blog they are commenting. When this happens, there are a few ways to handle it. Acknowledge the comment but ask to take it offline – If it seems the conversation could escalate to an extent that you wouldn’t want on display publicly, respond to demonstrate that you’ve seen the comment and plan to expand on it. That way, others who see it will know that you saw it and are addressing it privately. If the comment is housed on a blog, you’d typically have the person’s email address from when they filled out the comment form. If on Facebook, you may need to reach out to them for contact info, but that still can be done confidentially. Politely respond – Often, responding to clarify can help ease a misunderstanding, and having that response publicly available is useful in allowing others, who may have had the same idea, to understand your side of the situation. It shows you were listening to your audience and taking the time to understand their side then have a cordial discussion. Ignore – If the comment is simply dubious and doesn’t progress productive conversation, just let it be. No need to escalate something that doesn’t need to be escalated. Remove – If the comment is explicitly malicious, offensive, or inappropriate, remove it. Consider adding a disclaimer that notes any off-topic or off-color comments will be removed without notice. That way, if the commenter gets angry his comment was removed, you have a policy to allude to for justification. If you’re wondering about ways to protect your business from becoming vulnerable, the best course of action would be to consistently be monitoring your brand online, which includes both search results and social media. This ensures that any negative sentiments are spotted promptly. Then, if you have an appropriate plan in place, it’ll be easier than otherwise to tailor the plan to the specific situation and address it accordingly in a prompt manner. No one is immune from internet backlash but if you react afterward in a productive manner, things can turn around.